This Milagu Vada is generally made for Hanuman Jayanthi or whenever you want to offer a vada malai for Hanuman. Hence it is popularly known as Hanuman Vada or Anjaneyar Vada. The following recipe makes around 12 vadas. Dry grind the Urad dal and black pepper into a coarse powder. Add the ghee and salt to the ground mixture and form a soft but firm dough by adding water little by little as required. Heat oil in a wok and make small balls of the dough. Flatten each on your palm (or a greased plastic sheet on your palm) and make a small hole at the center and fry them in oil. If the dough is too firm and breaks when you try to flatten it, add little more water and try again. 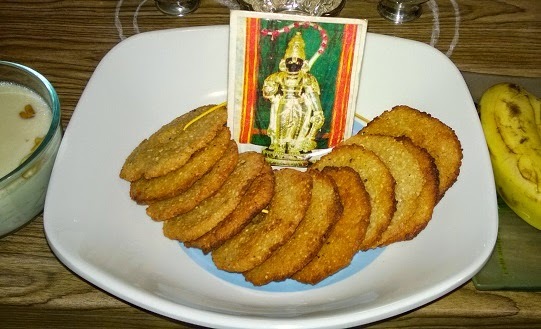 The Vadas are ready to be offered to Lord Hanuman.